With amazing indoor and outdoor water parks sure to put a smile on your face, be sure to make Minnesota your next getaway. Each park is unique and features a whole host of amazing rides and slides. Some of the parks and resorts even offer a variety of dryland activities in case the water just isn’t your thing. For those that want to get wet, you’ll be sure to be entertained for hours, and even days, at these great parks. With tons of fun rides and awesome attractions, you won’t want to miss the Water Park of America. 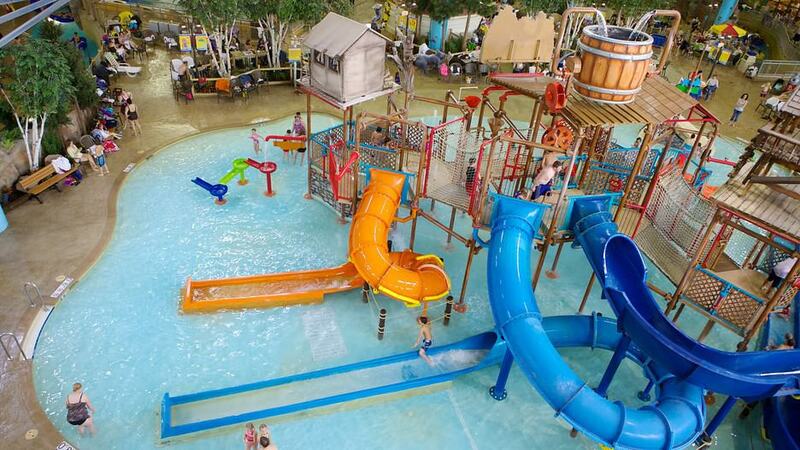 Children of all ages will have a blast at the Fort Snelling area which boasts a huge water playground and activities as well as zero-depth entry. Test your surfing abilities at the Cascade Falls FlowRider. The activity pool packs a ton of fun with features like water basketball and the lily pad crossing. The lazy river and wave pool are sure to make for hours of relaxing, splashing entertainment. For heart pounding adventure, visit the many rides. Grab the family and raft down the twists and turns of the Eagles Nest. Tube down the Eagles Nest 5th Floor Tube Slide or adventure down the body slides. Adults will love the Isle Royal Hot Tubs. For tons more fun be sure to visit the Northern Lights Arcade, or of course, the mall.